Specimen collection number SCL 15305 in the UBC Herbarium Algae Database. Search the collection number in the database for more information on this specimen, or search the species for further occurrences. Images courtesy of Sandra Lindstrom. The purple (sometimes greenish) blades of this species can reach 30 cm in width and length and can be found growing on rocks, or as epiphytes on other species of algae. Holdfasts are small and disc shaped, and like many other species of Pyropia (formerly Porphyra), blades are one-cell thick. Blade margins are ruffled and often deeply lobed. Delicate blades are iridescent when exposed to sunlight. The bladed form pictured here represents the gamete producing life stage, while the alternate, spore producing life stage (called the conchocelis phase) is microscopic, filamentous and grows inside the shells of molluscs and barnacles. Common and abundant in spring and summer, this species is grazed by limpets in the upper to lower intertidal zone. Its range extends from the Aleutian Islands south to Baja California, and includes the Bering Sea, the Sea of Okhotsk and parts of Russia. 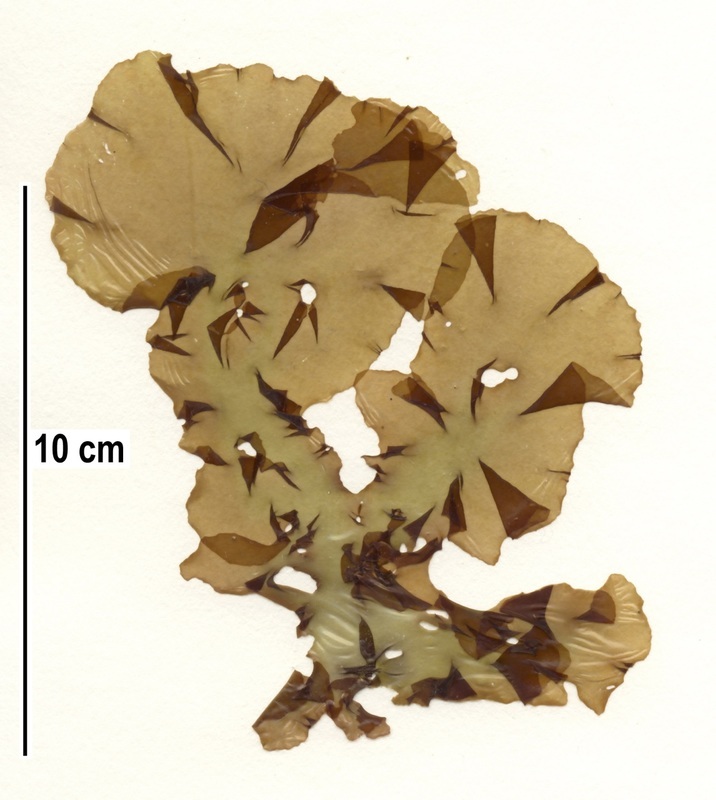 The specimen picturered here was collected from lower-mid intertidal boulders amid sand and bedrock on Fourth Beach, Calvert Island. Several species in this genus are difficult to distinguish without examining the DNA. This species is usually epilithic (grows on rocks) and only occasionally epiphytic, unlike other members of this genus. At low tide, this species also does not collapse into two dimensions like Py. fucicola, which resembles a small patch of oil when exposed during low tide. Pyropia perforata is also slightly thicker and larger than Py. fucicola. Nutritional studies of Py. perforata reveal that it is nutritionally dense, and has the highest caloric content of any seaweed tested in the study. ​Lindberg, M. and Lindstrom, S. (2010). Porphyra fucicola. Seaweeds of Alaska. Accessed 04/07/2016. O'Clair, R. and Lindstrom, S. Porphyra perforata J. Argardh. In Klinkenberg, Brian. (Ed.). E-Flora BC: Electronic Atlas of the Plants of British Columbia. Lab for Advanced Spatial Analysis, Department of Geography, University of British Columbia, Vancouver. Accessed 07/04/2016. Bea Proudfoot and Kelly Fretwell (2016).